From tiny settlements on the tiniest of islands to the contrasting "bustle" of Stanley, the Falklands capital, each island in the Falklands archipelago holds something special and unique to capture the enthusiasm of any visitor. Read our reports below to find out what to expect from your trip to these remarkable islands. 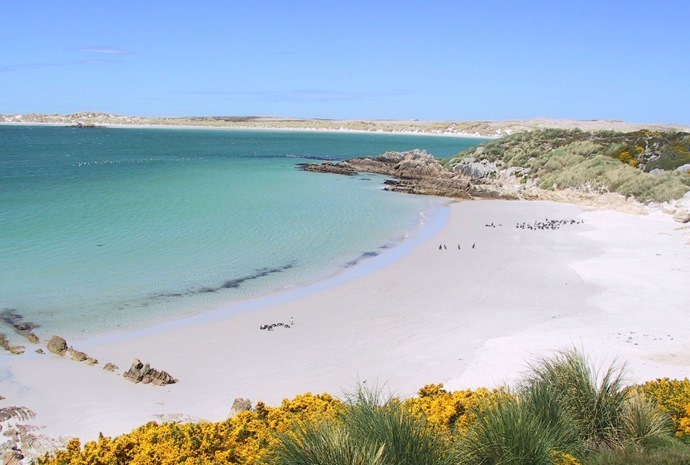 A long, low island with sandy beaches and cliffs to the south of East Falkland, it was originally known as Long Island and was recorded as such in the log of the Beagle in 1834. Lots of birdlife, including large colonies of rockhopper, gentoo and Magellenic penguins. 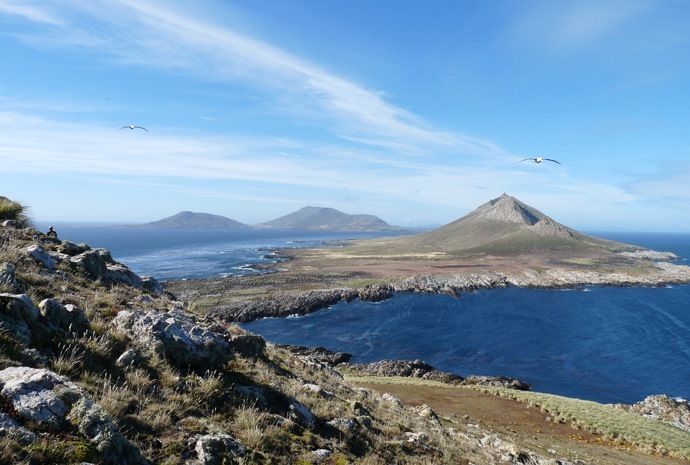 There are nesting Falkland skuas, oystercatchers and gulls on and around Sandy Beach and a nature reserve at North Point, which has nesting Southern giant petrels and king shags. Also to be seen are night herons, grebes, black-necked swans, geese and many smaller birds such as plover and snipes. Commerson's dolphins can also be seen riding the surf off Sandy Bay. Bleaker is a good island for walking. Ask to be dropped off at the North Point Nature Reserve, walk round the reserve and then follow the coast back along the cliff top and through the scrub to Sandy Bay, then via Big Pond back to the settlement, a distance of about 8 miles. Shorter walks include to Long Gulch to see the rockhopper and king shag colonies. Accommodation on Bleaker is in two self-contained houses. One has four twin en-suite bedrooms, large lounge, kitchen and conservatory and the other a single and two twin bedrooms sharing a bathroom, suitable for families or small groups. Good quality, home-cooked food including fresh beef and lamb from the farm run by your hosts Elaine & Robert Short. Located to the north west of West Island, Carcass is reached by a 40 minute direct (or longer if there are stops) flight from Stanley. It is especially rich in wildlife, partly due to the complete absence of cats, rats and mice which elsewhere predate on ground nesting and other birds. This is a great place to see small birds such as Cobb's wren, black-throated finch, tussock bird, siskins and Falkland thrush as well as rock shags, South American terns, striated caracaras and Falkland skuas. There are also large colonies of Magellenic and gentoo penguins. On Leopard Beach is a colony of elephant seals, whilst offshore, both Peale's and Commerson's dolphins can often be seen in the surf. 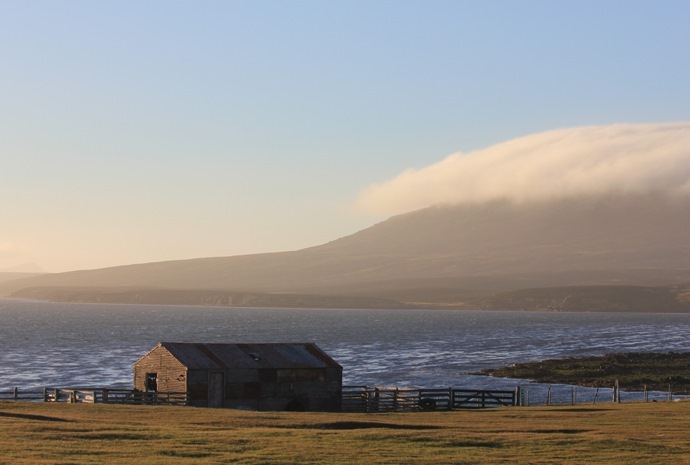 This is a great island on which to relax with comfortable accommodation in the lodge and a hostess who is renowned for her baking accompanying tea at any time of the day! Your hosts here are Rob & Lorraine McGill. Carcass Island is also the access point to West Point Island and Grand and Steeple Jason Islands and arrangements to visit must be made in advance through Rob McGill. 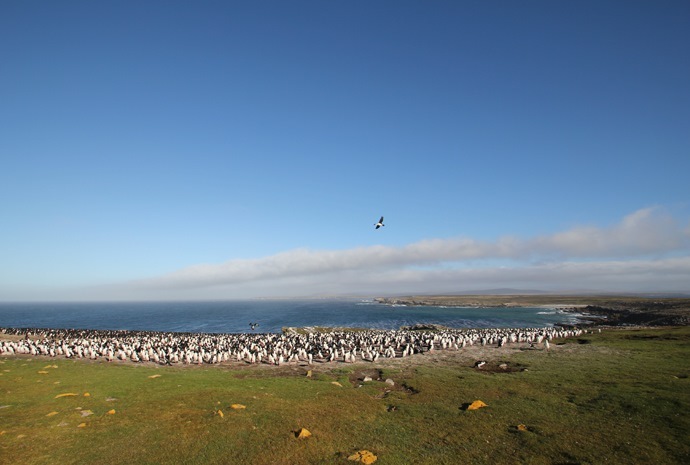 These most scenic islands are at the furthest north-west point of West Falkland. 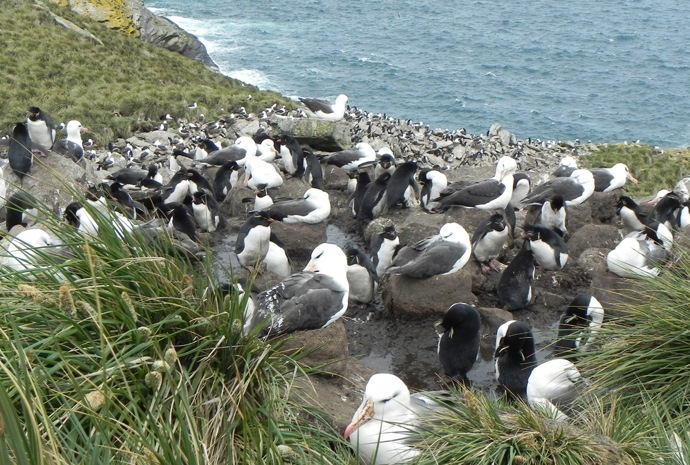 Both islands are home to large colonies of nesting black-browed albatross, which can be approached quite closely. These colonies are shared with rockhopper penguins and, particularly on Steeple Jason, rock shags. Grand Jason is cat, rat and mice free and there are therefore large numbers of ground nesting birds and invertebrates. Care must be taken not to disturb the nesting Southern giant petrels, which fly away if you get too close and therefore leave their eggs and chicks vulnerable to predatory skuas and caracaras (both of which also breed on the islands). Both islands are rich not only in bird life but also in flora, including emerald bog, which gives off a heady scent on a sunny spring day. 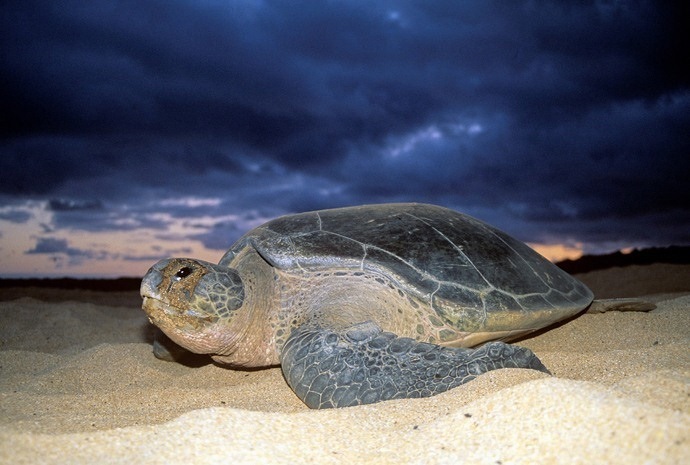 WILDFOOT can make arrangements to visit either or both islands through our contacts with Rob McGill on Carcass Island. 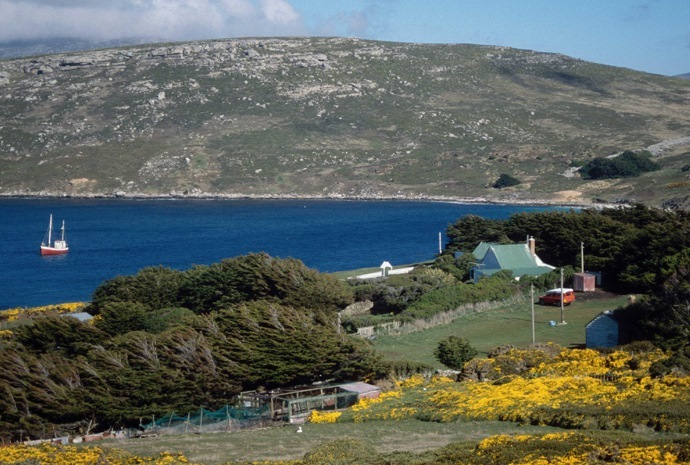 This is the most remote of the inhabited islands, being on the far west of West Falkland. It is known for its superb scenery and for the massive concentration of wildlife, including 41 species of birds, fur seal colonies and breeding groups of Peale's dolphins. Birds include nesting colonies of black-browed albatross, rockhopper and gentoo penguins, king shags and thin-billed prions; the latter only come ashore in darkness and take turns at incubation and chick rearing. Here, penguins also run the gauntlet of the sea lions as they leave shore or return in the surf. There are two nature reserves, North and South. These are run by separate managers, who both live in the only settlement. Both reserves are well worth spending time at, and attractions apart from the wildlife include beautiful flora and historical sites from the days of whaling and when penguins were gathered in their thousands and boiled down for their oil. Located to the north of West Falkland, this is the third largest of the offshore islands, named because of the beautiful pebbles found on some of the eastern beaches. The island is also special because it is the only one that has battlefield associations as well as being important as a significant site for bird and other wildlife. This island was the site of an SAS raid in the early days of the 1982 conflict, when a number of Argentinean aircraft were destroyed on the airstrip. There is also a memorial to HMS Coventry and, scattered over the landscape, the remains of Argentine fighter aircraft shot down later in the conflict. Wildlife here is spectacular with macaroni penguins and massive colonies of rockhopper, gentoo and Magellenic penguins, and king and rock shags, along with southern giant petrels, turkey vultures, peregrines, skuas, striated caracaras, waterfowl, including black-necked swans, and lots of small land birds. On the beaches and offshore are sea lions and Commerson's dolphins. There is a comfortable lodge on Pebble and a very friendly welcome from Riki Evans and his team. 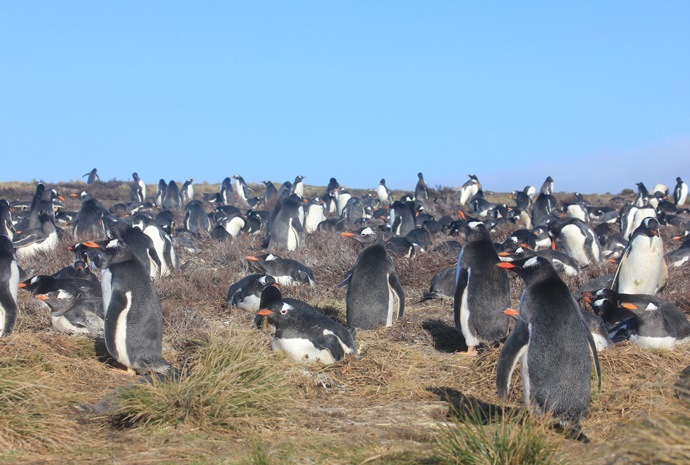 The island is 10 miles south of East Falkland and is particularly attractive because of the sheer quantity of wildlife available to observe within a short distance. There is a large colony of southern elephant seals, which shares the beach with sea lions and gentoo penguins. Other nesting birds include southern giant petrels, Falkland skuas, king shags, snipe, Cobb's wrens, Magellenic penguins, waterfowl, striated caracaras and short-eared owls. Offshore, pods of orca and Peale's dolphins can often be spotted, sometimes quite close in. 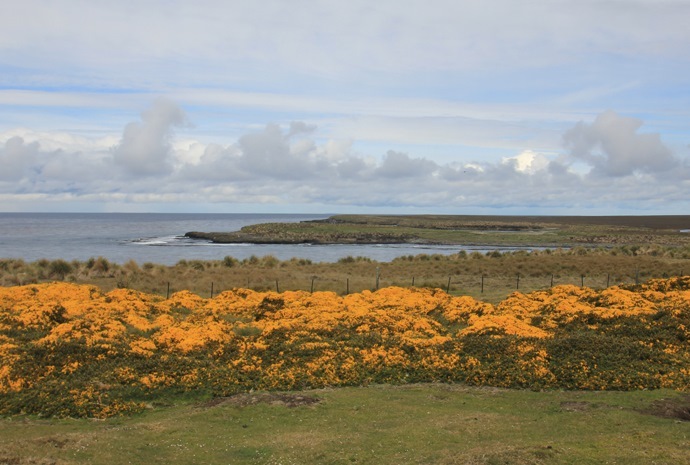 The mixed terrain has about 70 species of flowering plants, including the only recorded location of the Fuegian yellow violet on the Falklands. On Sea Lion is also the memorial to HMS Sheffield, sunk by enemy action during the 1982 conflict. A comfortable' light and airy lodge with food and drink always available from the resident manager, Carol Peck and her friendly staff. Currently, this island is only accessible by boat from Carcass Island by prior arrangement. However, the existing airstrip is due to be upgraded and it is expected that FIGAS flights will then include the island on their flight plan, making it available for day visits. The island is compact, scenically attractive and good for walking. The principal attraction is the large colony (over 14,000) of nesting black-browed albatross shared with hundreds of rockhopper penguins on the spectacular promontory of Devils' Nose. Also to be seen are striated caracaras, turkey vultures and lots of small birds including the striking long-tailed meadowlark, locally known as the military starling because of its bright red breast. 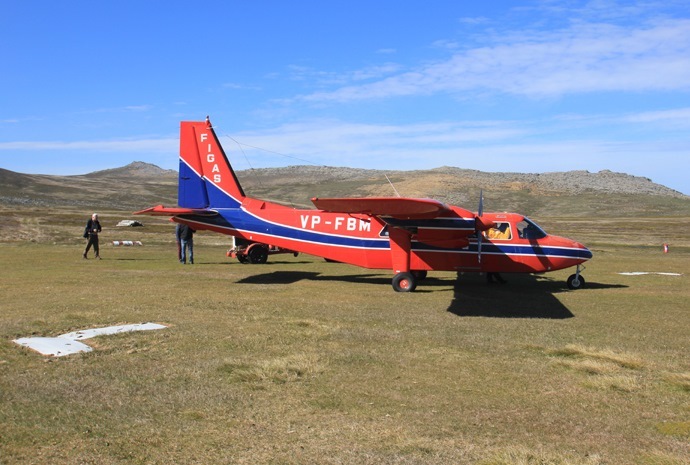 As each island has a limited road network, as part of WILDFOOT's Falklands tour packages you will be transported from island to island via the Falkland Islands Government Air Service (FIGAS) 8-seater Britten Norman Islander, a small light aircraft which allows you to take in the spectacular views below as you journey on to your next stop. Some of the more remote islands are currently only accessible via boat but this will also be arranged for you so all you have to worry about it is enjoying the views and soaking up the wonderful surroundings.